Here’s a funny little story. 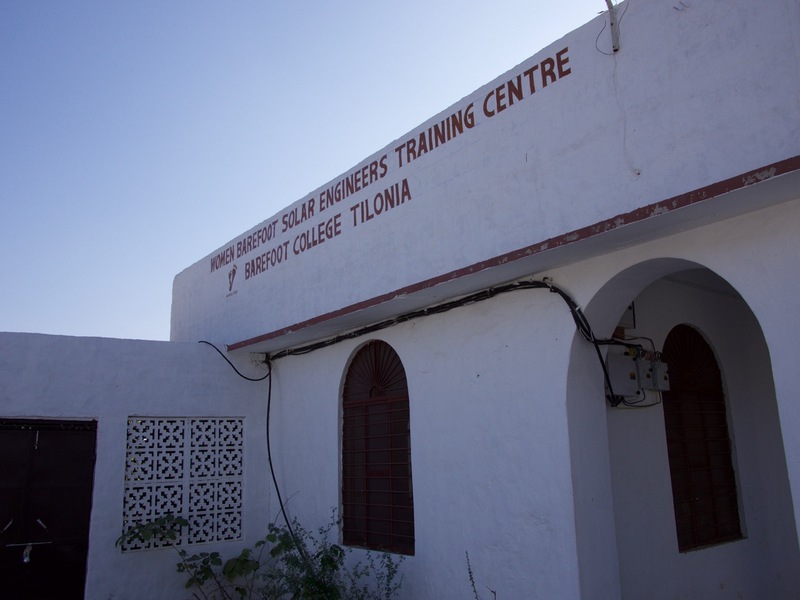 One of the things on our “things to do in Asia” wishlist that we accumulated over the course of a couple years was to visit a place called Barefoot College. 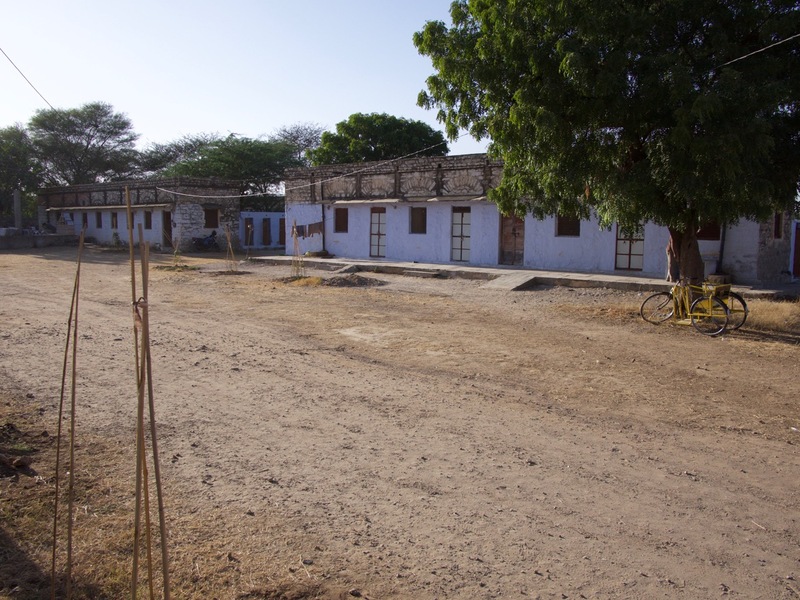 This is a school somewhere in the middle of nowhere in India where women from all over the world come to learn some specialized skills they can take back to their home villages. Beth learned about it from an article in some magazine she doesn’t even remember anymore. 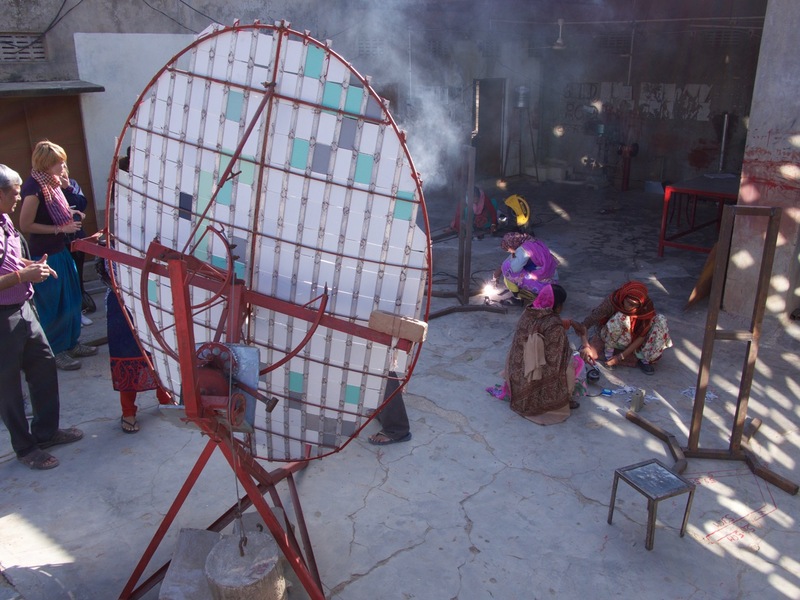 In particular, these village women learn about clean water systems, solar power, and so on. When we were doing our difficult planning of specifics of our travels in India, I left Jaipur on the list, as I thought we should hit all three corners of the Golden Triangle. But Beth, when she read about Jaipur, didn’t see much appealing there and wanted to take it off the list. 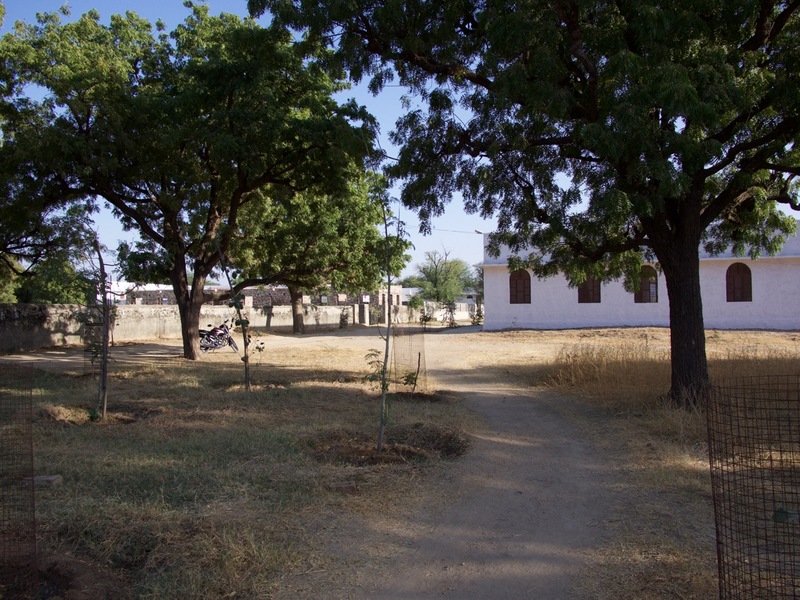 Instead, she wanted us to visit the Barefoot College (near the town of Tilonia), which is located about five hours west of Agra. “Wait,” I said. “Jaipur is four hours west of Agra. So maybe this Tilonia place is nearby.” Looking at a map confirmed it. Tilonia is just an hour west of Jaipur. So we’ve gotta go to Jaipur to get to Barefoot College anyhow. It all worked out in the end, and we were able to do both things. Yay geography win! 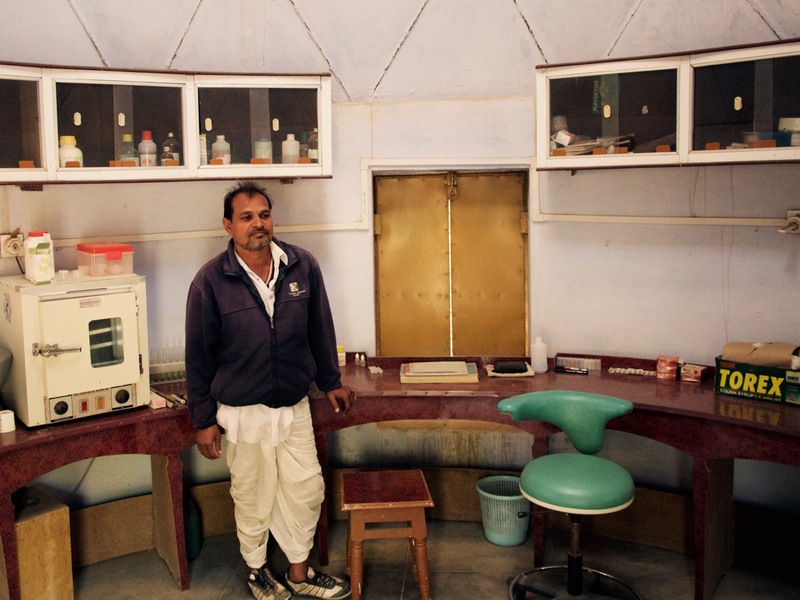 To get from Jaipur to Tilonia, you can take the train or drive. But there’s only one train per day, and it’s at some insane hour in the morning. 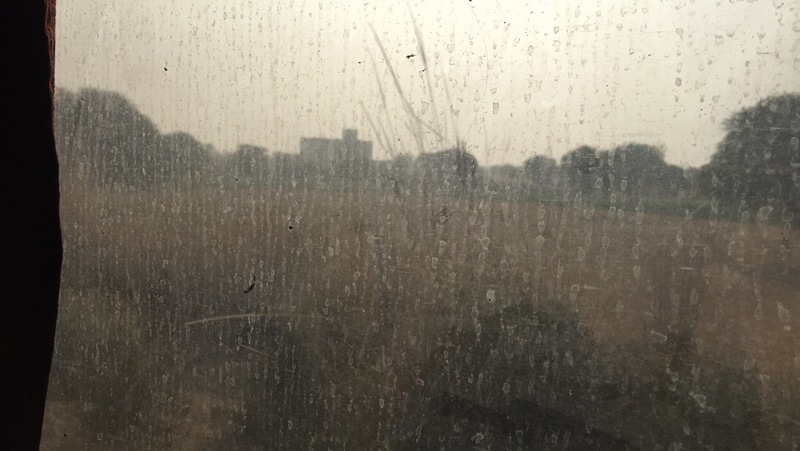 Much more convenient is to take one of several trains from Jaipur to Kishangarh, a nearby city, and then take a taxi from Kishangarh to Tilonia. 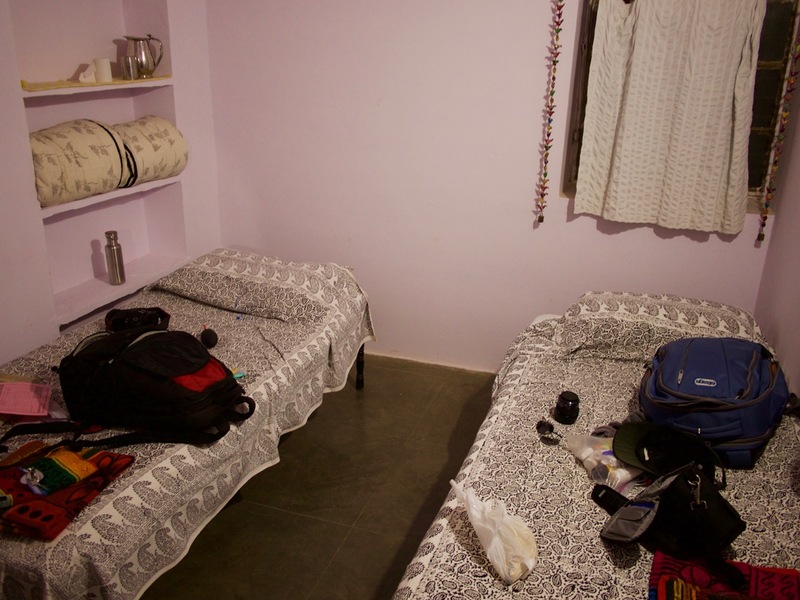 Beth had contacted someone at Barefoot College to arrange our tour and overnight stay, and she said the taxi should cost about 400 rupees, which turned out to be right on the nose. By this point in our trip, I had been trying for two weeks to figure out how to buy rail tickets online, but it is really, really difficult. Essentially, you need both an Indian mobile phone number and a credit card that an Indian credit card processor will accept. They don’t accept American American Express cards, for instance, only Indian American Express cards; how’s that for irony? And my new Indian mobile phone still hadn’t been activated. So, with Sameer’s help (remember Sameer from my last article? ), we bought generic “quick tickets” at a nearby shop across the street from the rail station, and then upgraded to AC Chair Car with the attendant on the train. I was pretty sure there were CC (the code for AC Chair Car) seats available, because I could see the status of the train online (including how many seats were available), even though I couldn’t buy a ticket online. On the left are the original tickets we bought across the street from the station. 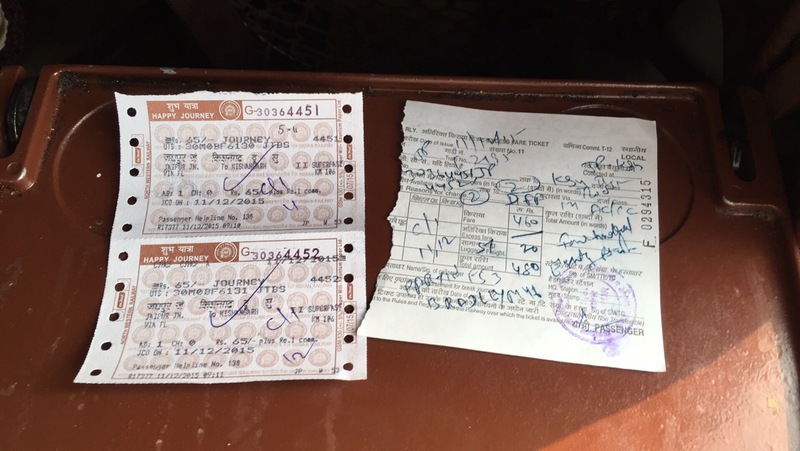 The thing on the right is the receipt showing that we upgraded onboard by paying the attendant in the AC Chair Car in cash. 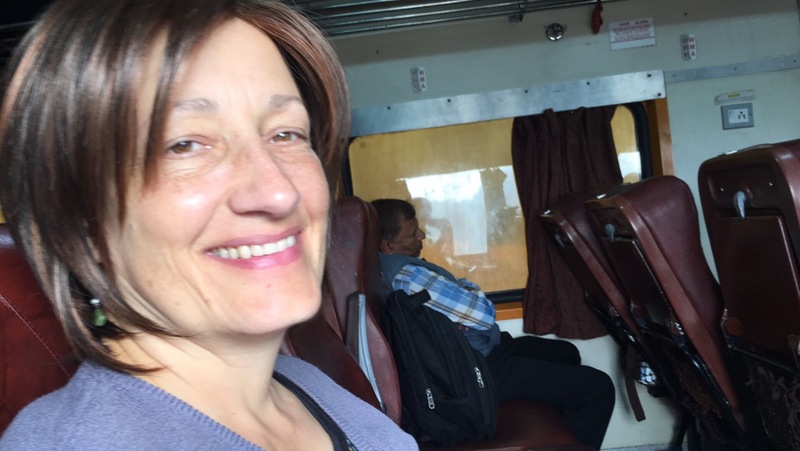 Beth Partin and I are finally on our first Indian rail trip. 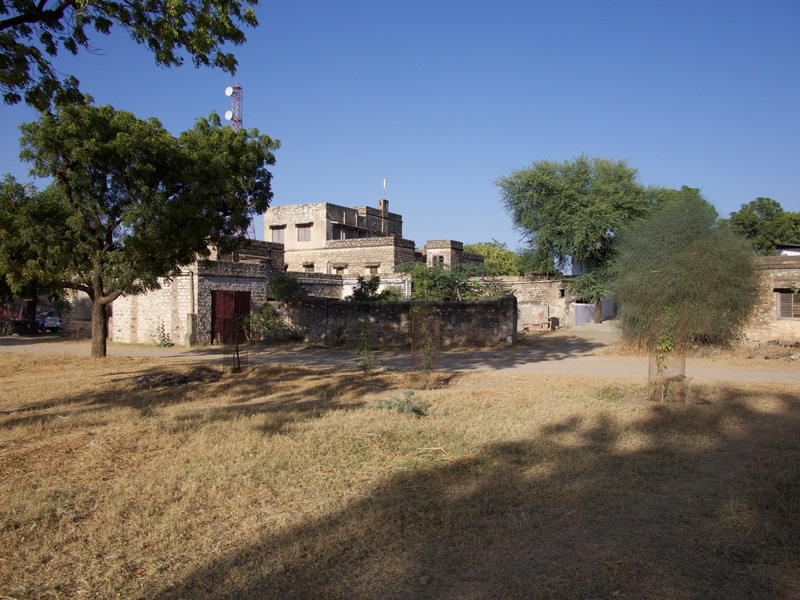 We are going from Jaipur to Kishangahr, where we will take a rickshaw to the village of Tilonia. Modes of transport accomplished in India so far: aircraft, automobile, bus, train, bicycle rickshaw, golf cart, and auto rickshaw. 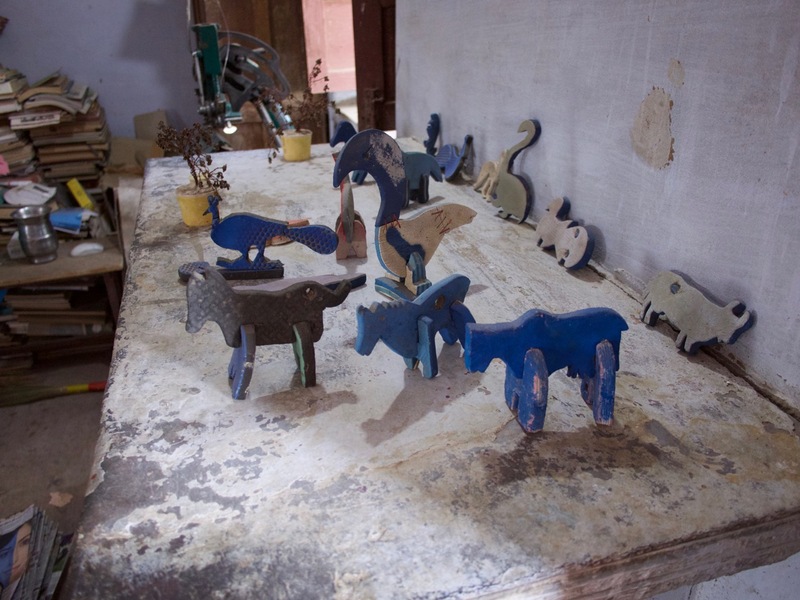 Not yet attempted: camel, horse, bullock cart, and boat. Beth is enjoying travel by train. Blurry photo taken with expensive mobile phone camera. The hour went by pretty fast in the AC Chair Car. This is the peak of luxury for Indian trains, way cleaner and roomier than much of the rest of the train, and you pay for it. The tickets were several US dollars each, a factor of five or six times as much as the lower classes of ticket. Still, this luxury car would be considered substandard, terribly run down and dirty in Western Europe or the US. It’s all a matter of perspective, I guess. We couldn’t see out the window very well, as it had been pitted and covered by smoke and pollution and not washed in a long time. But what we could see was nice countryside. It was soothing to get out of the city of Jaipur and into the desert. The landscape in the Tilonia/Kishangarh region reminded me a lot of the US southwest. The vegetation, dirt, and hills all looked pretty similar. I even got homesick on the journey. 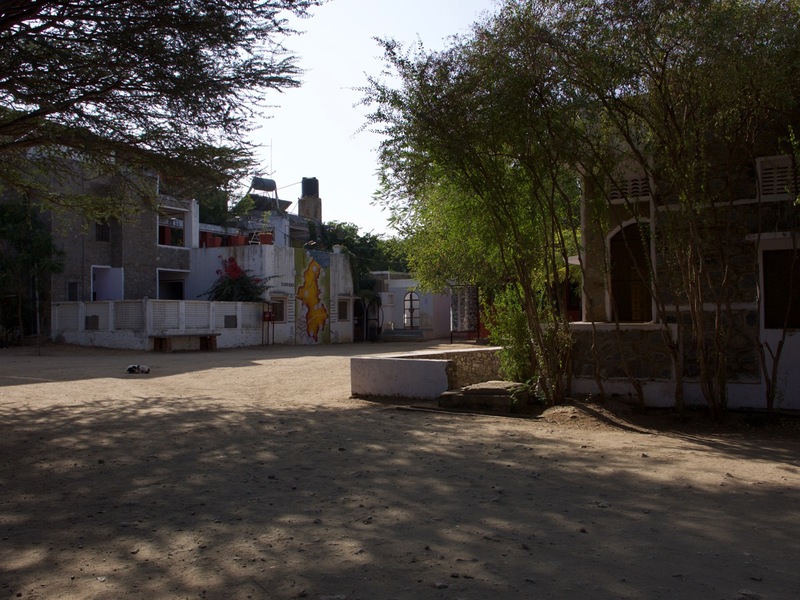 After arriving at the Kishangarh station, we found a hotel restaurant and had some lunch, and then caught an auto-rickshaw to Barefoot College. The driver wanted exactly 400 rupees, as we were told to expect. The drive was beautiful, but we soon learned that the driver had dropped us off at the old campus, and the tour and guesthouse were at the new campus. Fortunately, a woman we met (maybe a teacher?) walked us from one to the other, about 1 km away. With that squared away, we checked into our room, relaxed a bit, and then went on a tour with a tour guide and several other tourists. 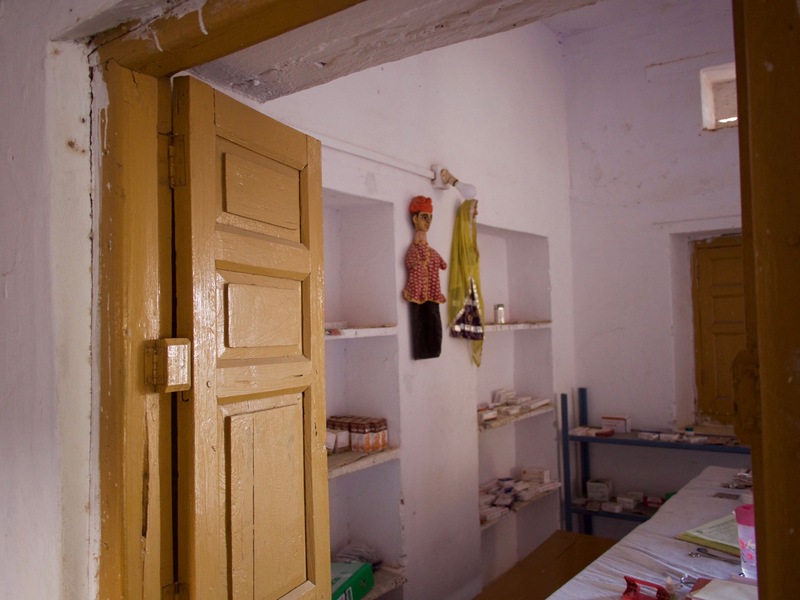 The old campus was an old tuberculosis hospital complex that had fallen into disuse after being abandoned decades ago. 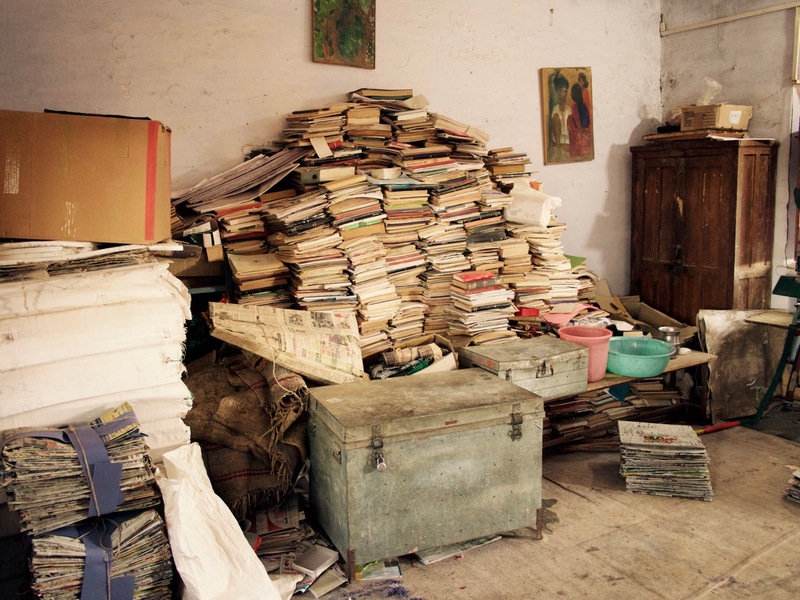 This organization asked to use it for their classes, and eventually convinced the Indian government to rent it to them for one rupee per year. The new campus came along more recently and was built from scratch for this purpose. We learned that there are a few operations going on here at the same time. 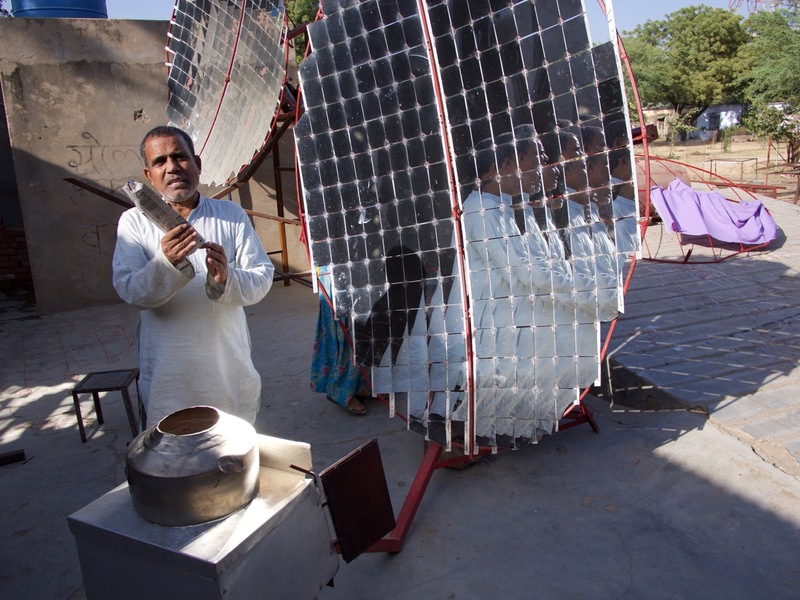 One of them builds these solar powered cookers. They have a big parabolic dish that collects the sun’s rays, focuses them, and uses the intense heat to warm a small oven that is used for cooking food. An ingenious design with a pendulum and gears makes it so the cooker follows the sun automatically throughout the day. Backside of the parabolic dish used in the solar cooker, showing the gears that keep the mirrors pointed at the sun. Also, notice that none of the fabrication takes place at work benches. The women all are most comfortable on the ground. 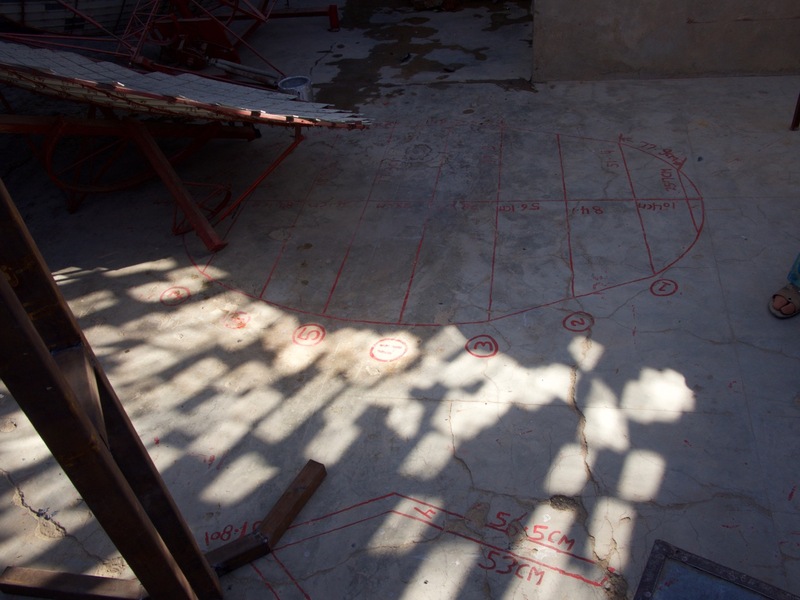 The “blueprints” for the solar cooker are actually painted on the floor, so there’s nothing to misplace or blow away. Many of the women who build these things are illiterate or marginally literate, so one theme we’d see all over the campus was reliance on pictures instead of text to explain how to assemble things. The red drawing on the ground is the template for building the solar cooker. 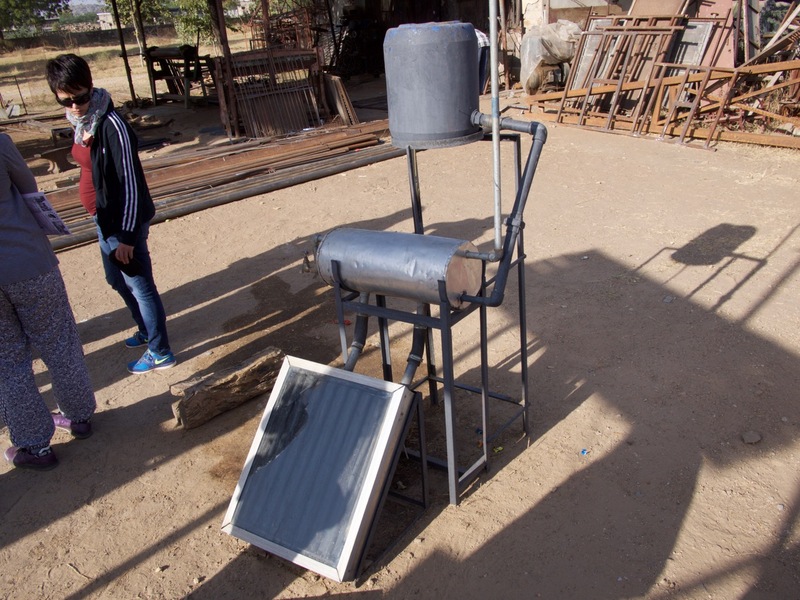 Next to the outdoor workshop for building the solar cookers is the workshop for building solar water heaters. Why are these things important? A few reasons, I suppose. The main one is that the women of these villages around the world spend much of their days finding and gathering and transporting wood and other fuel back home for cooking and water heating purposes. If they spend less time on that, they can spend more time doing things like caring for their families, earning additional income, or finishing a basic education. 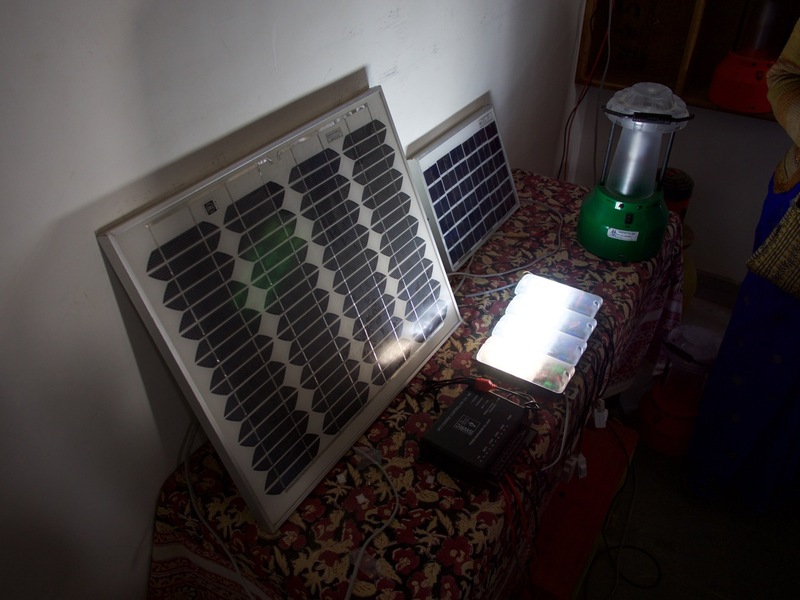 The second reason is that the sun is free and clean, and replacing wood burning or dung burning ovens with solar ovens reduced pollution in general, but specifically in the homes and villages of these people. And that means they’re healthier. But beyond the practical matter of improving the quality of life in villages in the developing world, these uneducated women return to their villages with rare skills that not even the men have. So their stature in the community rises. People who normally have very low value in society now have high value. And they can teach other women these same skills. Almost all of them set up a small community business around the solar lanterns. They can sell them, and then provide service when something goes wrong, unlike a lot of NGOs who come to the village, drop off a bunch of tools or gadgets, and then leave again. 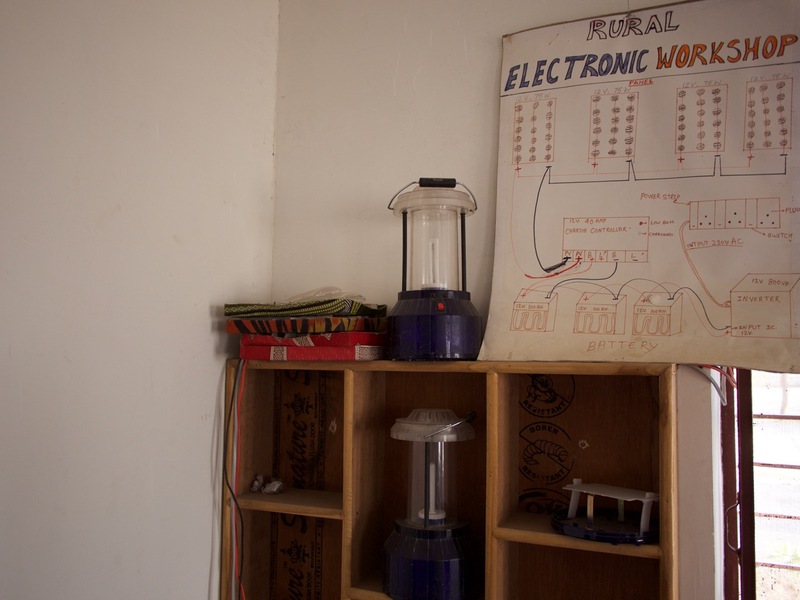 Next we saw what appears to be the primary purpose of the school, and that is training village women – grandmothers – from all over the world how to build and repair solar powered lights. That includes collectors, controller boxes, battery operated lanterns, and related stuff. 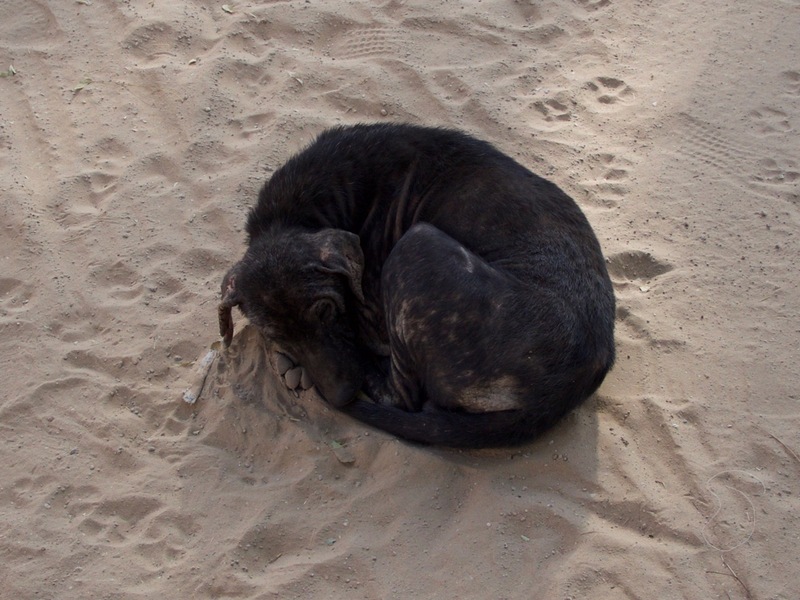 This is the only place we’ve seen in India where a dog can sleep peacefully in the middle of the road. Main classroom area for solar lantern training. These women come from Asia, Africa, and South America. The students from Guatemala were especially excited that half our tour group could speak Spanish. I’m sure after six months the women get sick of only being able to speak to the other two or three Hispanics in the school. They didn’t speak any English or Hindi or Rajastani. If you’ve ever done basic electrical work, you recognize the standard wire colors and numbers. 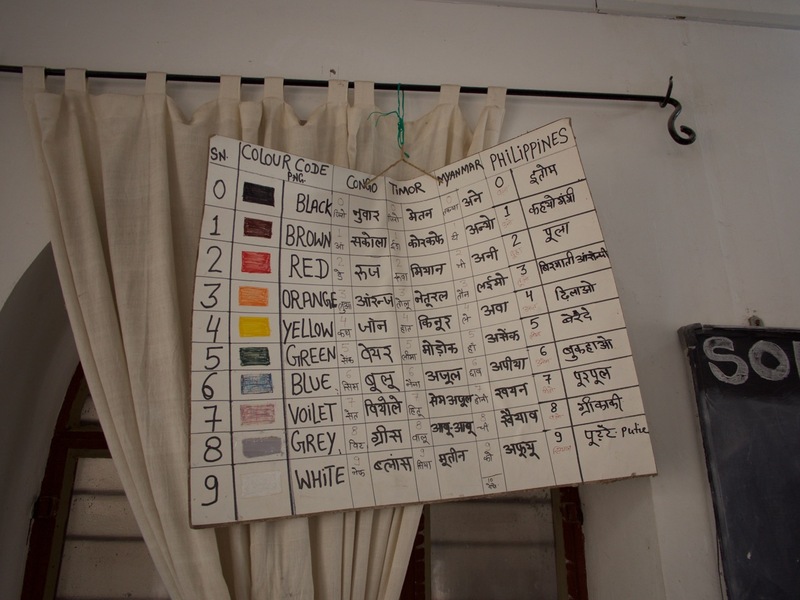 The only explanation I can think of for the other columns in the table are that someone wrote the names of the colors in the languages used in Congo, Timor, Myanmar, and Philippines, but wrote them in Hindi. Once you complete your training in the solar light stuff, if you still have time in your six month residency, you can choose another thing to learn. 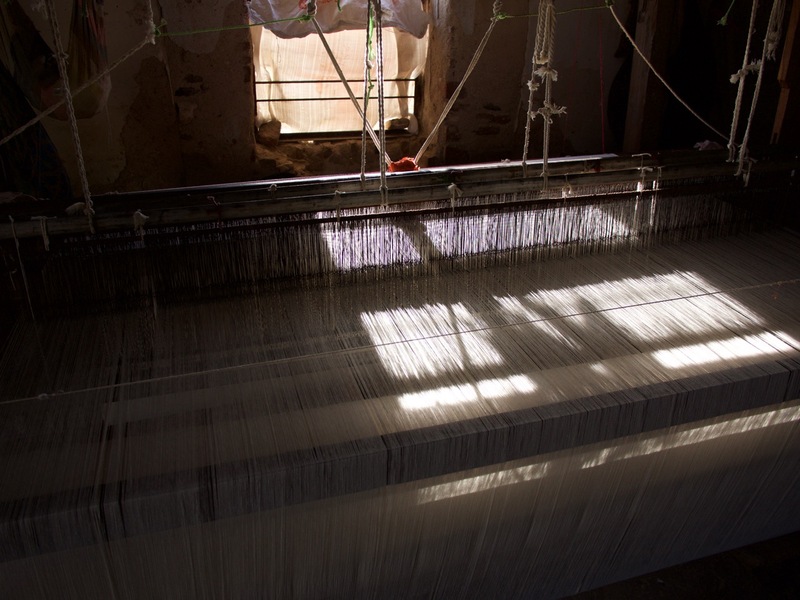 Options include weaving, making sanitary napkins from paper and cotton, mosquito nets, paper crafts, and some other things I forgot. 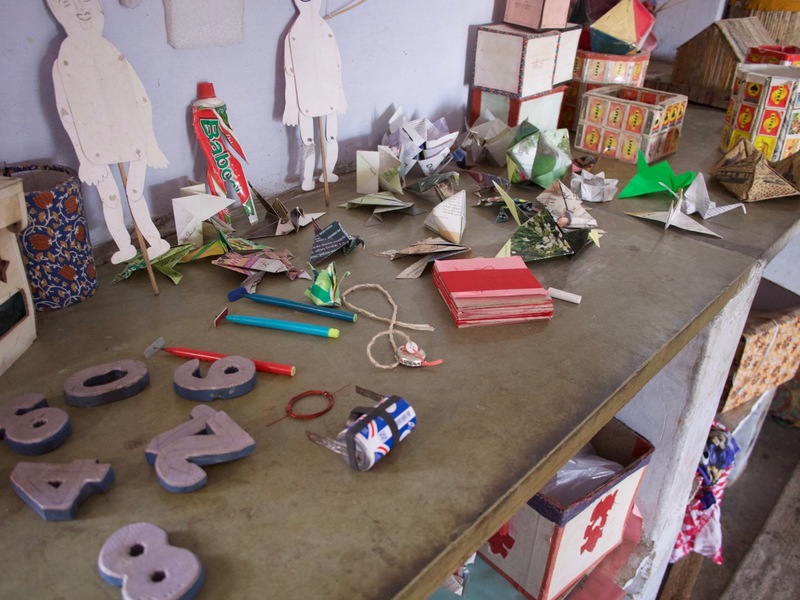 This is all waste paper that they have collected to be repurposed into new things – toys, decorations, etc. Here are students in the new campus learning how to build and repair solar lanterns. There were three young men there, which I didn’t understand since only women students are allowed. Also, Indian students all live and study at the new campus, while foreign students all live and study at the old campus. 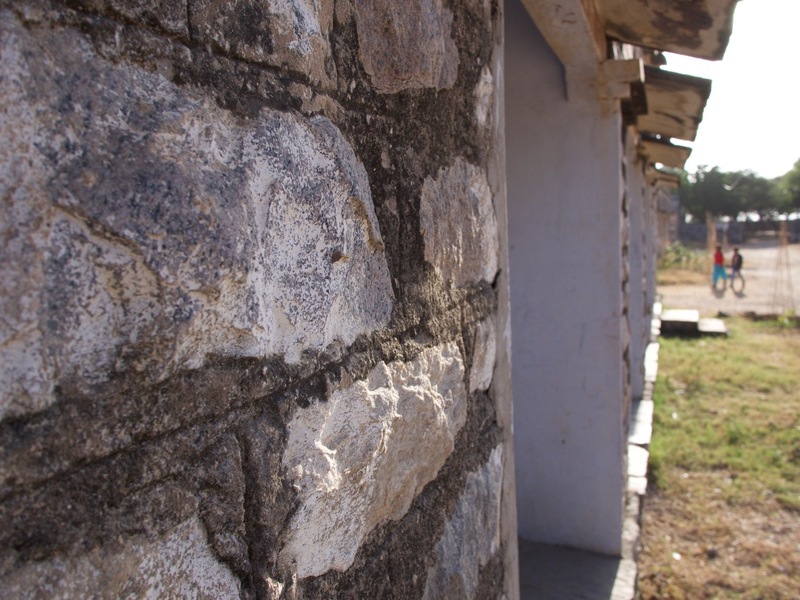 There are hundreds of women each year passing through the Barefoot College on their six month program, and so the college also needs all the stuff to house, feed, and care for all the students. 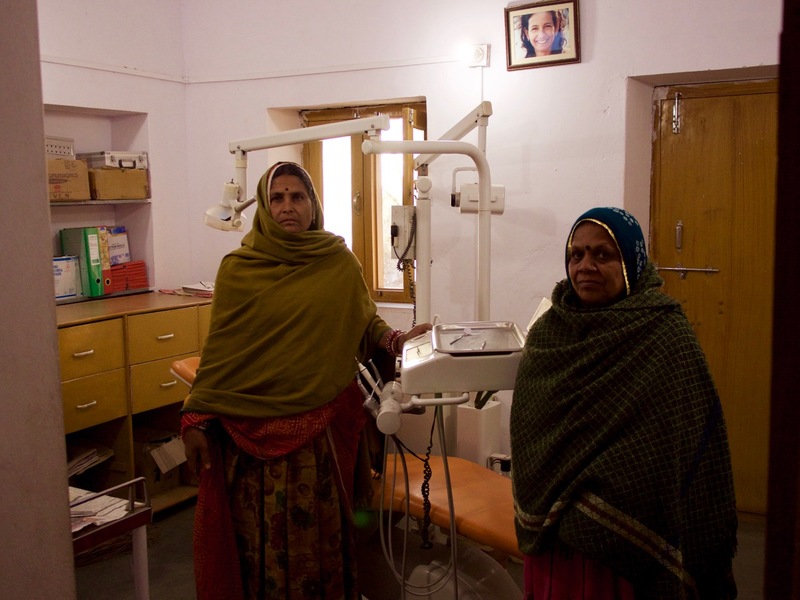 So the college has an onsite dentist office, staffed by two village women who learned basic dentistry hands-on, rather than going to college or a trade school. These two village women are now qualified to do basic dentistry. They’re not allowed to do root canals, but can do cleanings, check-ups, and fillings. There’s also a medical clinic, including a self-taught lab technician who can do about a dozen standard blood and urine tests. There is a real certified dentist that comes by once in a while for root canals, and a real doctor on call, but the organization really works to train what they call “non well qualified” people to do everything needed. The group uses consensus based decision making, so there is no top-down authority model. 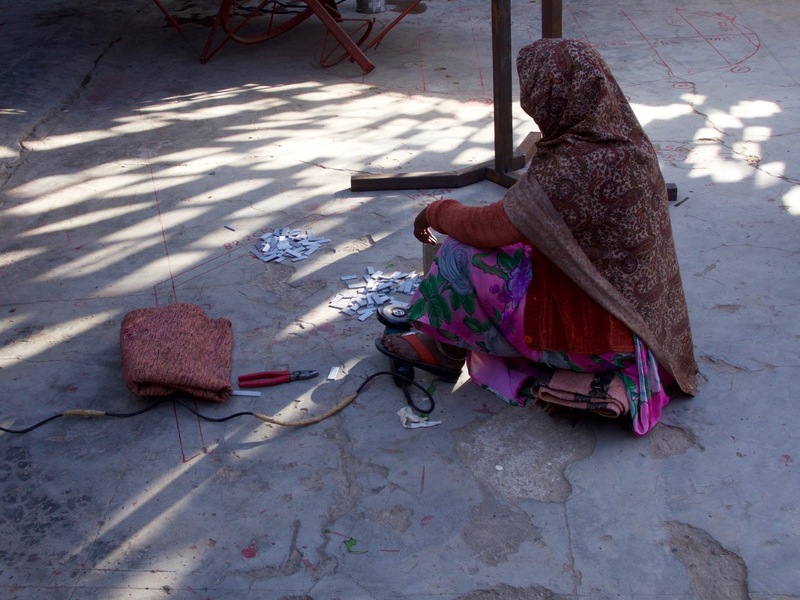 And unlike most of the rest of society in Rajasthan, the women are in charge of their own destinies. Here is the self-taught medical lab tech. There isn’t a very good social network for the disabled in India. So when he came to Barefoot College, he was a beggar since he can’t work a regular unskilled labor job due to his leg. 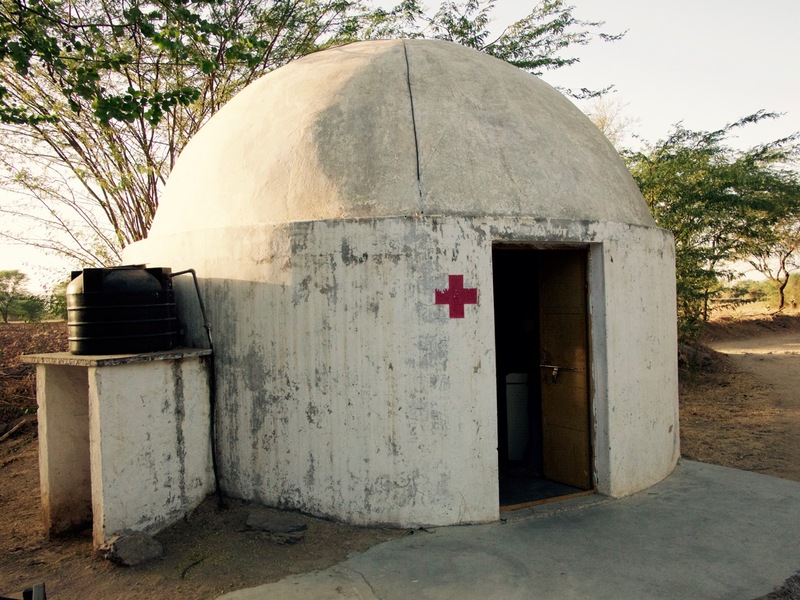 Here is the concrete hut where the medical lab is. I like the building because it looks like something you’d find on Tatooine. 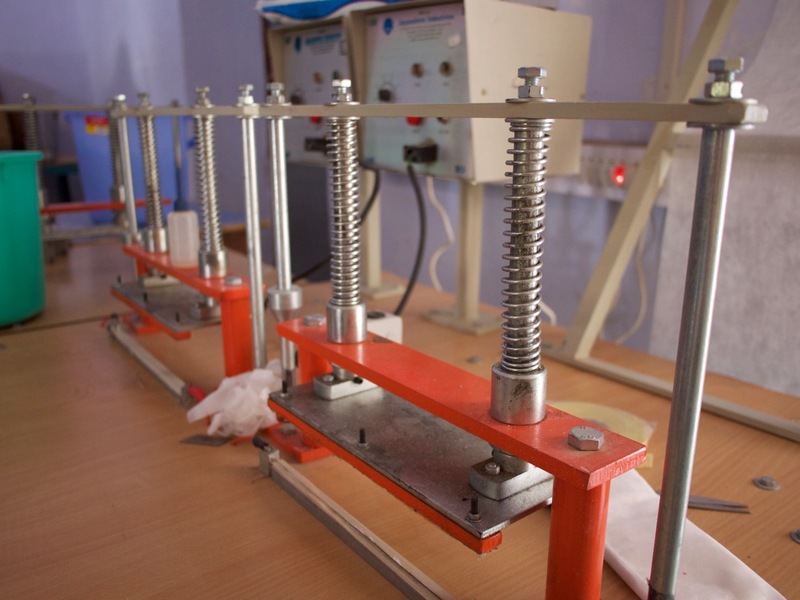 One thing the college has done is a complete study of the quality and level of groundwater in the region. It’s not good, and this is one thing they’re trying to educate the local farmers about. The college also takes in disabled people who would otherwise be beggars on the city streets, and teach them useful trades to help around the college. I was really shocked by how many polio survivors there are my age here. I’ve only known one person in my life who survived polio, and that was Beth’s father Bill, who was born long before the polio vaccine existed. Being from the US, I assumed polio was a disease of the past. But in backwoods India, people still get it. I saw many hand-cranked bicycles for people who can’t pedal with their legs, and a few polio survivors work various jobs at Barefoot College. That night, we joined in the communal supper, which, like most basic meals in India, consisted of bread, boiled squash (or something very much like it), and a choice of either really spicy lentils or not-so-spicy lentils. I pigged out and had both kinds of lentils. After washing our dishes, we retired to our room and slept soundly through the night. No barking dogs, no calls to prayer, no roosters, no honking traffic. In the morning, we had breakfast, which was, you guessed it, bread, squash, and a choice of either really spice lentils or not-so-spicy lentils. Plus chai. Then we had a brief second tour Saturday morning. 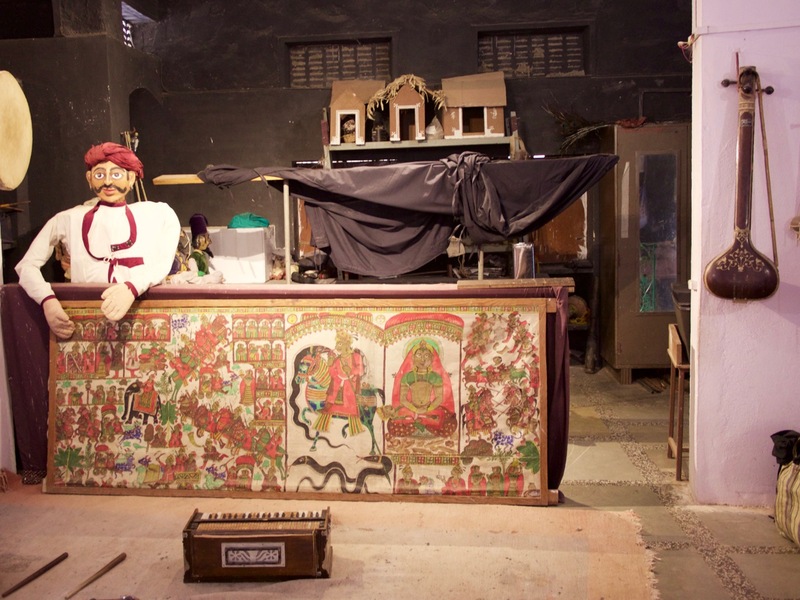 First we saw the puppet room. A big part of the organization’s outreach is to do puppet shows. 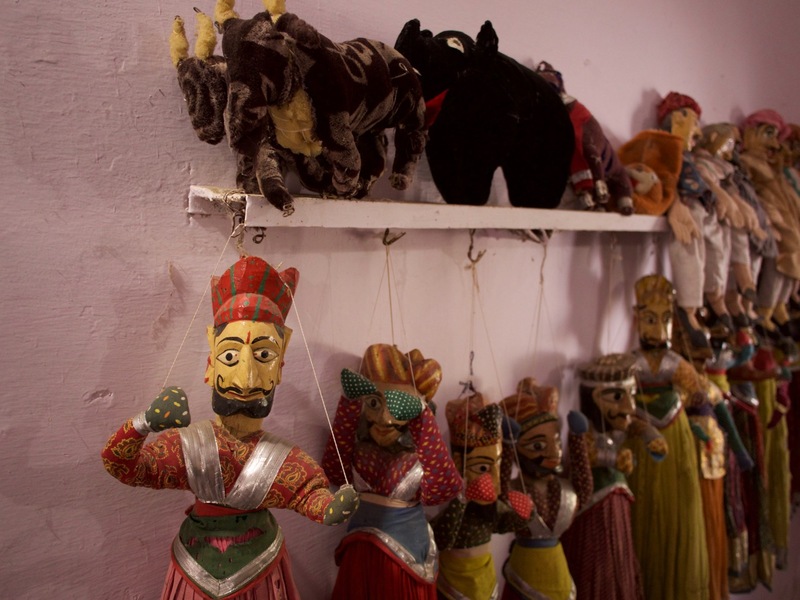 Puppetry is a Rajathani specialty, and the tour guide’s passion. 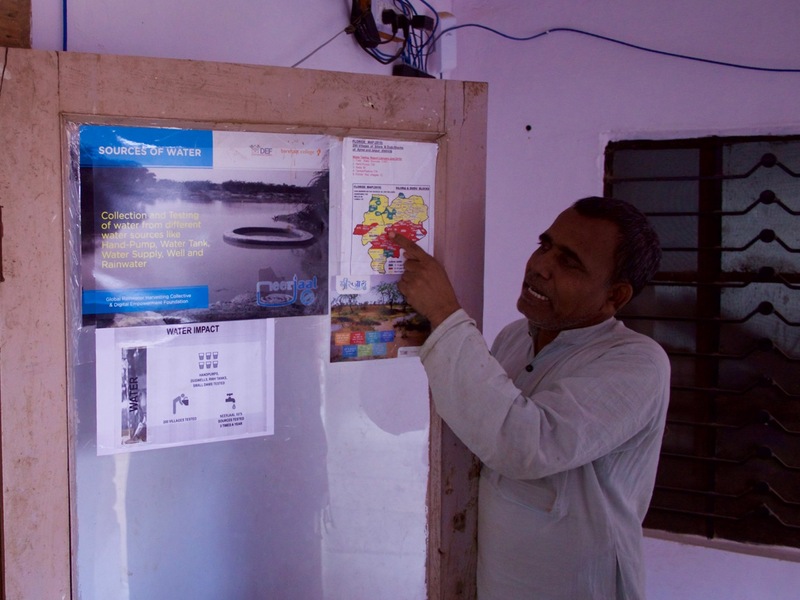 So they go around to schools and villages and put on puppet shows to try to teach the concepts they’re trying to disseminate – techniques for healthy living, ecologically friendly farming, etc. 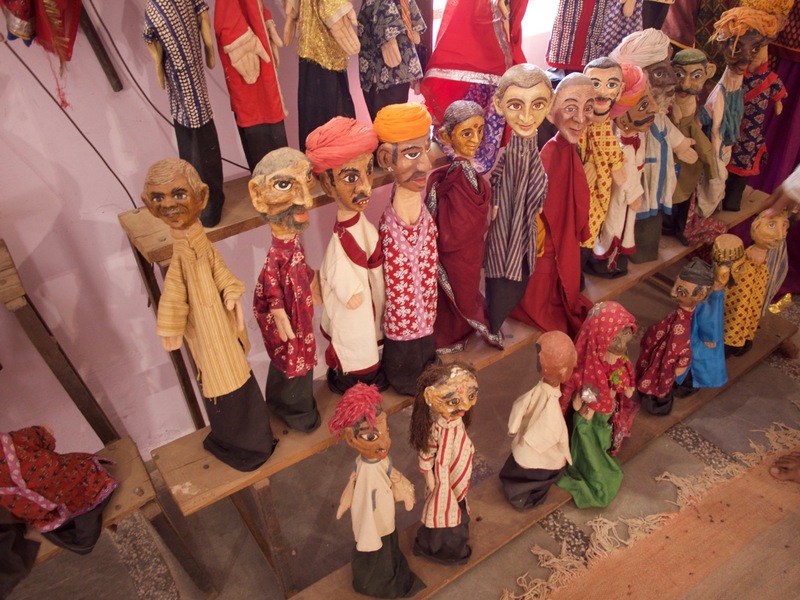 The puppets are supposed to look like all types of people, from government leaders to beggars. If you look carefully you can spot the Dalai Lama here. The really big head is for a puppet that you wear as a costume. It’s about 3 meters tall. 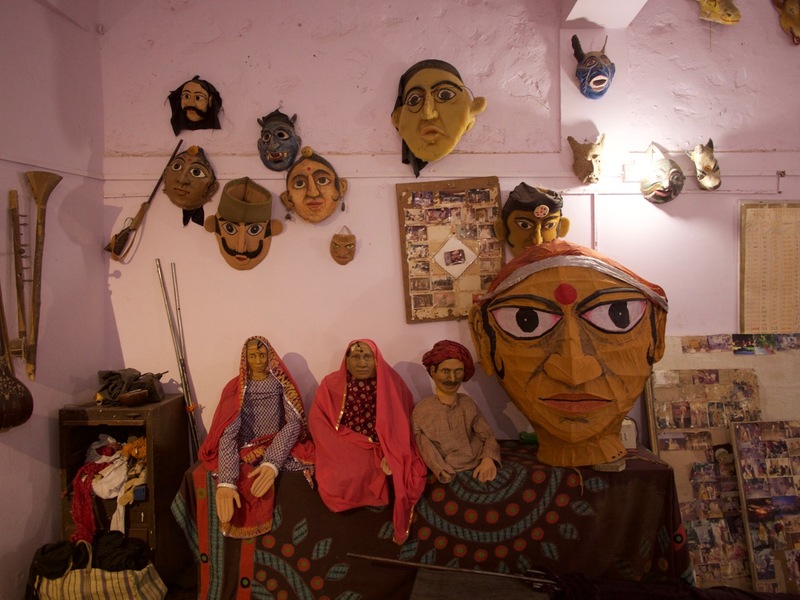 Most puppet shows are done out in the field where the people live, but they occasionally put on a show here at the college. This is the stage for when that happens. 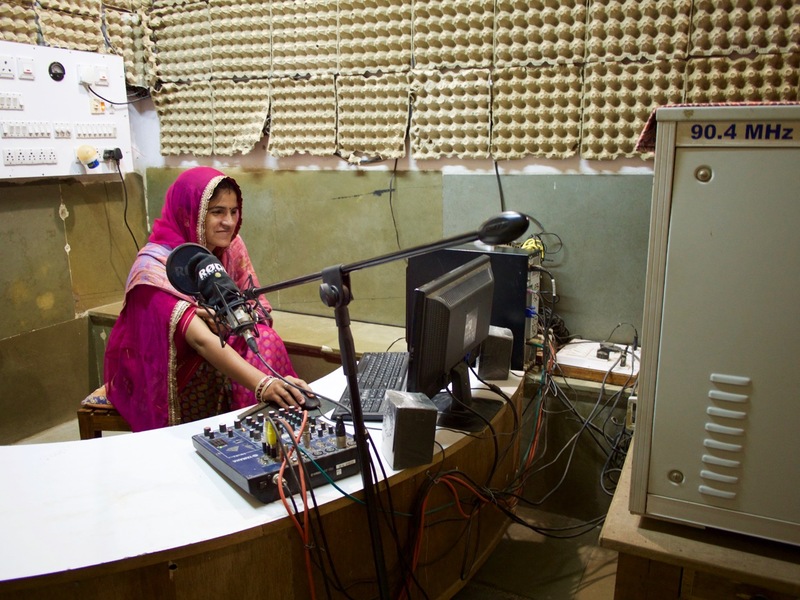 After the puppets, we visited the campus radio station, which broadcasts in Hindi and Rajasthani to the surrounding area. They have things like interviews about sustainable farming, and music. As with pretty much everything, it’s run by local village women. People on campus can listen to it, of course, but really it’s more for the surrounding community. Here’s the woman who runs the radio station. I liked their makeshift sound proofing, repurposed cardboard egg cartons. 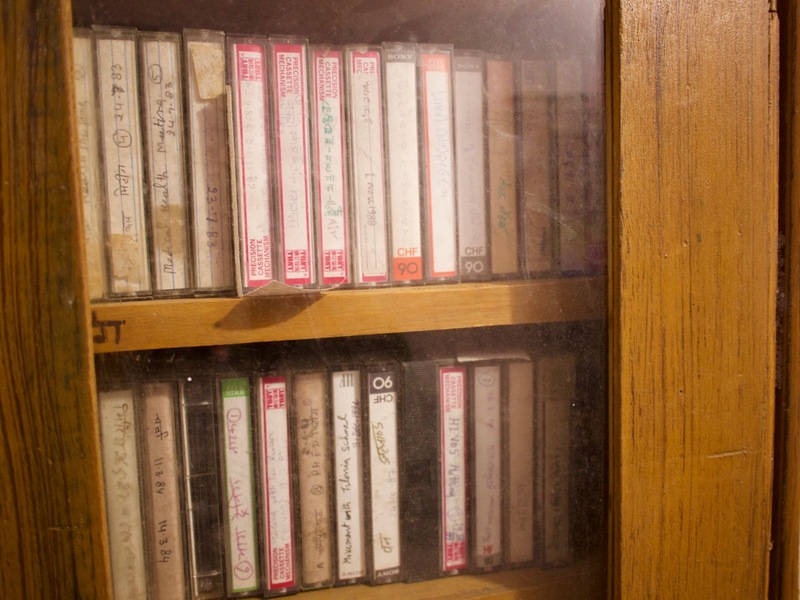 They have a huge library of every interview and program they’ve ever broadcast since the radio station went online…all on cassette tape. Well, that was the most dramatic boarding of a train. Our train back to Jaipur came to a stop at the Kishingahr station. It was scheduled to be there for ten minutes, which should be plenty of time to walk down the platform to find our car and board. But after about 30 seconds it starts rolling. Beth shouts. I jump onto the slowly moving car. She’s right behind me, but some other guy decides to make a last ditch dive out the same door, blocking her path. She grabs on to the hand rail and tries to pull herself up with this big guy pushing her off from inside the train. Then he stops pushing and lets her on, so he can leap off. I grab her arm and help pull her aboard as the train accelerates into the countryside. For a second there, I thought we were going to get separated, with Beth holding our tickets and a cell phone that doesn’t work, and me on a train without a ticket. Good thing we only have our backpacks today, and not our suitcases. Technical note about the photography: All the photos of the Barefoot College were shot on my GH4 using my “pancake” lens. I wanted to mix things up a bit and give myself some new photo challenges to improve my skills. So instead of using the zoom lens I normally use, I left my 14mm f/2.5 lens on the whole weekend. A couple days later, I did a day of sightseeing photography using only my iPhone 6s. That was after I learned that the single photo that people liked the most so far was something I just took spontaneously on my phone. So why am I lugging this camera around, it left me wondering.